Landing Zones 1 and 2 (LZ-1 & LZ-2) at Cape Canaveral Air Force Station, Florida, USA on February 6, 2018. "Each of Falcon Heavy’s side cores, or boosters, is equivalent to the first stage of a Falcon 9 rocket with nine Merlin engines. At liftoff, the boosters and the center core all operate at full thrust. Shortly after liftoff, the center core engines are throttled down. After the side cores separate, the center core engines throttle back up." Synchronicity: the state of "occurring at the same time; coinciding in time; contemporaneous; simultaneous." Congratulations to Team SpaceX & Elon Musk! "Falcon Heavy is the most powerful operational rocket in the world by a factor of two. With the ability to lift into orbit nearly 64 metric tons (141,000 lb)—a mass greater than a 737 jetliner loaded with passengers, crew, luggage and fuel—Falcon Heavy can lift more than twice the payload of the next closest operational vehicle, the Delta IV Heavy, at one-third the cost. Falcon Heavy draws upon the proven heritage and reliability of Falcon 9." 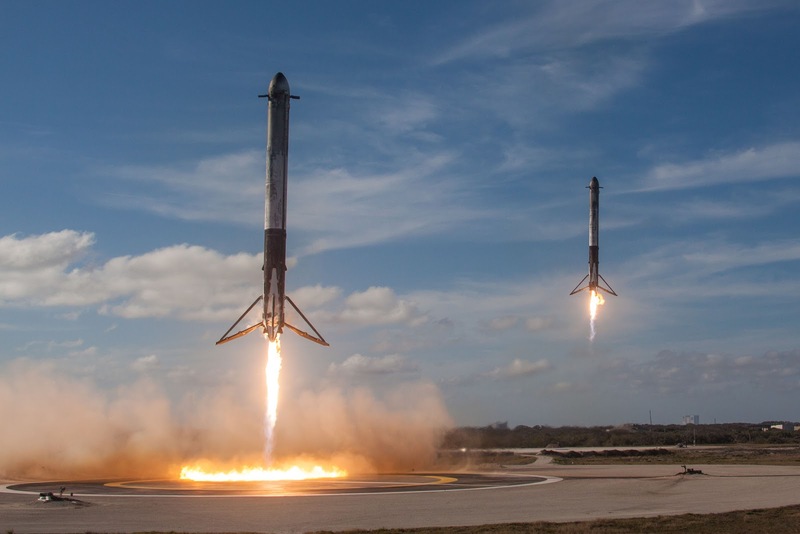 "Its first stage is composed of three Falcon 9 nine-engine cores whose 27 Merlin engines together generate more than 5 million pounds of thrust at liftoff, equal to approximately eighteen 747 aircraft. Only the Saturn V moon rocket, last flown in 1973, delivered more payload to orbit. Falcon Heavy was designed from the outset to carry humans into space and restores the possibility of flying missions with crew to the Moon or Mars." SpaceX Falcon Heavy Launch Successful! Elon Musk wants to go to Mars! SpaceX Falcon Heavy's Historic Blastoff!